UPDATE: the presentations have been uploaded on the conferences website. there was significantly more emphasis in the Greek answers: Even though, in most questions their beliefs appear to be similar to those of other Europeans, their answers were more “emphatic” i.e. their answers were less divided compared to other EU countries. 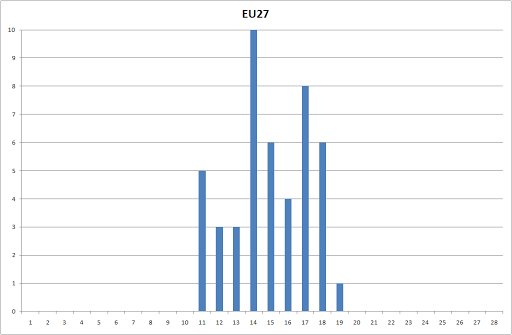 I noticed this by eye, and in an effort to “quantify” it, I ranked all European countries according to their responses using the graph charts presented in the Eurobarometer report. In these graphs, the countries were plotted in descending order, according to the value of the majority and minority percentages in those questions. The country on the far left was thus ranked “1” since it showed the greatest majority percentage. Similarly the country on the far right was ranked “28” (the average of all 27 EU countries was included in the ranking). This is just a teaser of the data i am plotting. QC6.8 (see below) is maybe the question whose answers showed the biggest difference between Greece and the UK so far (I am half way through all the eurobarometer tables). 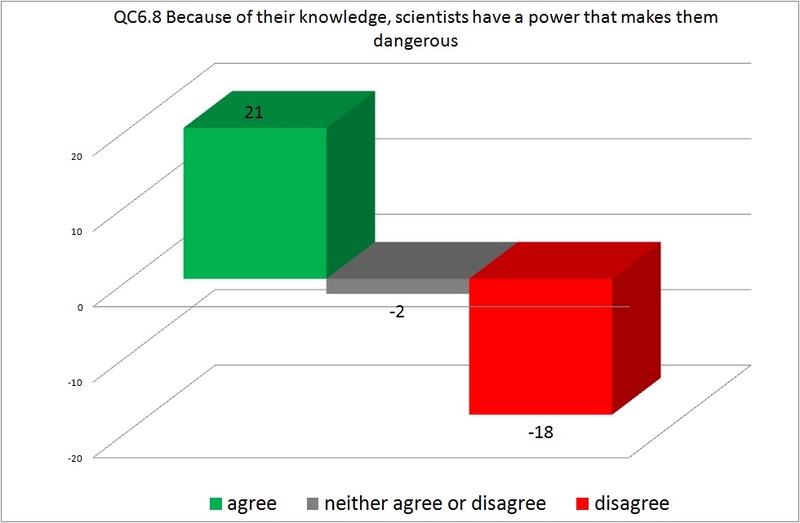 So a lot more Greek than British people feel that “because of their knowledge, scientists have a power that makes them dangerous”. When all EU27 countries are ranked according to their belief in this statement, Greece is on the one end of the spectrum (2nd most agreeing) and the UK is at the other end of the spectrum (6th least agreeing). Could this maybe be part of the explanation of why the one country reacts and the other doesn’t?